Creating a list of recommended vacation rentals can be a challenging task when each and every rental is worthy of being recognized. 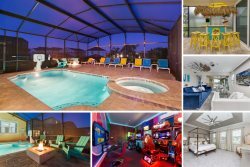 Therefore, the following are just a few of our Orlando vacation rentals that embody everything that people love about Reunion Vacation Homes. The homes are beautiful and spacious, but amazing communities and locations are a big part of what makes them great places to stay as well. It all starts with a cozy and luxurious place to relax in between your adventures throughout the area. In these rentals, you will find a home away from home that you will never want to leave. Your one of a kind Florida vacation begins the moment you walk through the front door and you are greeted by vibrant colors and open spaces indicative of the relaxed pace of life for which Florida is known. All of our vacation rental homes are fully furnished, so you can be sure that you will be cozy and pampered during every moment of your stay. You will find comfort everywhere - in the high-quality beds and linens, in the beautifully situated living room that is perfect for gathering with friends and family, whether you are enjoying the flat screen TV, the amazing views, or a nice conversation. The comfort factor in these homes is awesome, but so is the convenience factor. The greatest asset here when it comes to convenience is a fully stocked kitchen. Granite countertops and top of the line appliances also bring a little luxury to your culinary experience as well. Many of these rentals also offer fun amenities like hot tubs, swimming pools, outdoor bars, built-in grills, and more! Regardless of the specific recommended rental you choose, you can be sure that you will enjoy the incredible ease of access to all of the fun and beauty that the area provides. Many of these homes are a part of communities that offer the amazing golfing that the state is known for, swimming pools, picnic areas, and much more. If you need a break from the kitchen, you will be very pleased with the amazing restaurants that speckle the area. Whether you are looking for a unique pub or a fine dining experience, you will find what you are looking for close by. And of course, you are never far from the endless theme parks that make Orlando one of the most visited cities in the world. The best thing about these rentals is the variety in which they come in. These are not rentals solely for the rich; you can find a beautiful place to call home during your stay here regardless of your budget or the size of your group. You are sure to find the perfect place to spend your Florida vacation in one of these exquisite recommended rentals.